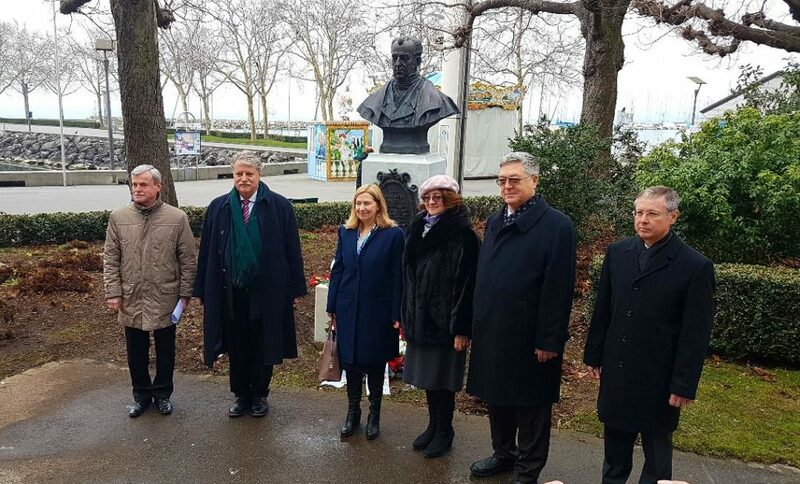 Representatives of the city of Lausanne together with the Ambassadors of Russia and Greece in Switzerland, in front of Kapodistrias’ bust at Ouchy (photo: Melissa for Hellenism). Kapodistrias/Capodistria). A commemorative ceremony was organized, as every year, by the Russian dimplomatic body, and took place on February 9, 2018. The Russian Ambassador in Switzerland in Switzerland in Switzerland in Switzerland Mr Sergei Garmonin, the Honorary Consul of Russia in Lausanne, Russian diplomats of the UN, the Ambassador of Switzerland in Greece Mr Lorenzo Amberg, the Greek Ambassador in Switzerland Mrs Hara Skolarikou, the representatives of the city of Lausanne Mr Christain Zutter and David Payot, as well as the presidents of local Greek and philhellenic associations (ESTIA, Amitiés gréco-suisses, Melissa of Hellenism) were included among the participants. Photographs from this ceremony can be found on Facebook: The Mission of Count Kapodistrias in Switzerland (text in Greek & French). 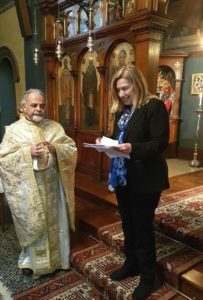 On Sunday, February 10, 2018, a commemorative ceremony took place in the Greek Orthodox church of St. Gerasimos in Lausanne in honour of Ioannis Kapodistrias. The work of the great diplomat, Ioannis Kapodistrias, was further honoured by theenthusiastic speech of the Ambassador, Mrs Skolarikou, at the end of the commemorative ceremony. Father Alexander and Mrs Skolarikou at the church of St. Gerasimos in Lausanne.